“This is a document worthy of the care and attention Richard Caniell has lavished upon it. The cast includes a quartet of great artists, at or near the height of their powers, and a master conductor of the Italian operatic repertoire. Most problematic of the four vocalists is the exponent of the title role, Gina Cigna. To be sure, the issues are a direct product of the singular challenges posed when performing Bellini’s heroine. Norma demands a soprano of extraordinary stamina. She must be a singer who can combine vocal beauty, power, and flexibility. And all of these gifts must be skillfully employed by an artist with exquisite musical tastes, and the dramatic subtlety and inspiration worthy of the finest Shakespeare actress. Among those who have left us complete recordings of the part, Maria Callas in her vocal prime (early to mid-1950s) probably is closest to realizing all the supreme components in this role. Cigna, one of the leading dramatic sopranos of her day, and making her Met role début as Norma, is able to handle the majority of the challenges, and in a most admirable way. Cigna’s identification with the role is never in doubt. She, like all the principals in this performance, understood that Bellini’s recitatives deserve every bit as much dramatic care and musicianship as the great set pieces. Cigna phrases the music with great affection and sensitivity. While some may find Cigna’s approach at times a bit melodramatic, I do not. Cigna also possessed a rich and brilliant dramatic soprano, and she never flags throughout the opera. On the debit side, moments that demand the utmost vocal flexibility are a challenge for Cigna, and there are a few occasions when high notes miss their mark. 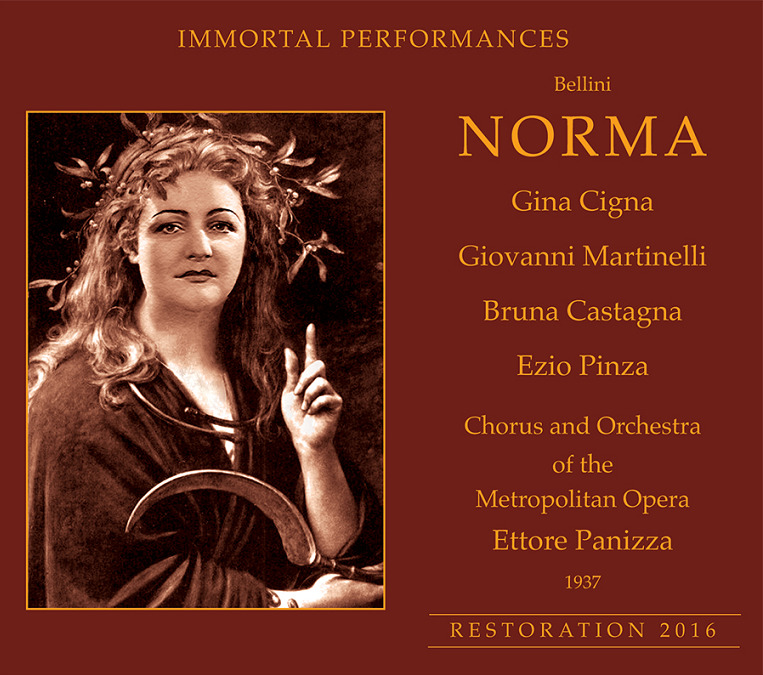 Still, Cigna was an important artist and I think her performance, especially in collaboration with such distinguished colleagues, makes this NORMA a most compelling document. No reservations need be applied to the remainder of the principal singers. Tenor Giovanni Martinelli was 51 at the time of this broadcast, and singing his first Met Pollione. Martinelli had been performing at the Met since 1913 and was in the final stages of his vocal prime. In a few more years, while the artistry would remain as compelling as ever, the voice would begin to lose some of its luster and security. Martinelli’s tenor was never the richest, most classically beautiful voice, but it was one of tremendous power and concentration. Martinelli was also a great singing actor. His diction and legato were exemplary, and his almost superhuman breath control allowed him to deliver long phrases in a manner other tenors could only dream of. Martinelli is in top form on this occasion, delivering a brilliantly sung, three-dimensional portrait of a character who often emerges as a stock figure. Mezzo Bruna Castagna, in marvelous voice, offers a beautifully sung and richly detailed portrait of Adalgisa. Bass Ezio Pinza provides true luxury casting as Oroveso. He sings both arias to perfection and, despite his relatively brief time on stage, is able to create a portrait of considerable nuance. Conductor Ettore Panizza delivers a characteristic performance, marked by impressive precision of execution and a superb balance of energy, inexorable momentum, flexibility of phrasing, and tremendous rapport with his singers. In this Immortal Performances issue, Richard Caniell has brought the artists to the forefront, with strikingly greater presence, definition, and color. These improvements are accompanied by an increase in surface noise, but I find that a small price to pay for a restoration brings this performance and its artists to life in a way I had not previously heard. The correction of the pitch defects is, of course, most welcome. “Beyond recorded sound, Cigna clearly comes alive in a staged performance with an audience. Her intensity in the monologue ‘Dormono entrambi’ is heartbreaking and powerful. She inflects every phrase with specificity and appropriate color, and in my experience is surpassed in that way only by Callas and perhaps Gencer. It is true that from time to time Cigna does force the voice and turn strident. Cigna’s ease with fioratura is clearly limited (Milanov’s was not much better), and some passages are simplified while others are clearly uncomfortable for her. But on the positive side, there is a basically lovely tone with a real glow in it, a complete involvement with the drama and with specific text. Her Norma is throughout a real and tortured human being struggling with deep internal conflicts, at once proud and powerful, but genuinely vulnerable. 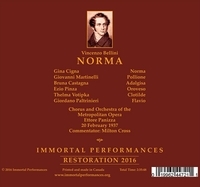 This is NORMA as dramatic Italian opera in the grand tradition. Not only Cigna, but all of the principals and the wonderful conductor Ettore Panizza, combine for a thrilling evening of gripping music theater, with characters who are real people, not cardboard cut-outs, singing beautiful melodies. Perfection is perhaps even more elusive here than it is with other roles. Cigna has some vocal rough passages….High notes, and some of the passagework demanded by the score, find the soprano stretched. But the compensation is in the vast majority of fine singing, and the completeness of the character that she portrays. The big scene that opens the third act, ‘Dormono entrambi’, is one of Bellini’s most daring conceptions - not really recitative, not really an aria, but something inhabiting an odd space between them. This is the scene where Norma considers killing her children, and then is repelled by the fact that she has that thought. The mood is set, importantly, in the orchestral introduction, and Panizza is masterful. He establishes the dramatic tension through his use of dynamics, subtle rubato, and phrase shaping; we are prepared for the drama of Norma’s monologue. Cigna doesn’t disappoint. Every word is clearly articulated, spit out with incisiveness and meaning. The first two words are filled with portent. The torture of the character, the fight going on within her, is crystal clear in every measure. This is truly great singing-acting, and we are fortunate that it is preserved here. Cigna’s 1936 studio recording is not nearly as powerful in this crucial scene. Her declamation is much more matter of fact. Also in the opera’s final act, Cigna rises to the occasion with a combination of glowing vocalism and trenchant coloration. This Norma is alternately defeated and proud, and we hear it all. There is no denying the occasional shrill high note or struggle with some passagework, but those moments pale when set against the grandeur and power of Cigna’s overall achievement. What this most definitely is not is a ‘bel canto’ Norma. Dewey Faulkner’s excellent, and candid, notes accurately point out that Cigna’s repertoire was in the dramatic and verismo arena, and she brings that sensibility to Norma. She spits out venom at Pollione and Adalgisa in a way we do not associate with this score, but then immediately follows with some very beautiful singing. At ‘In mia man alfin tu sei’ Cigna hurls the words out at Pollione with utter disdain. At moments like that those looking for a more ‘pure bel canto’ line might be offended; others will find it gripping. I know of no Norma like hers, and while it would never be the only way I want to hear the opera, and it can fairly be described as uneven, I do feel richer for having experienced it. And I much prefer it, flaws and all, to Cigna’s tidier 1936 studio recording. Bruna Castagna, a mezzo-soprano of enormous value to the Met from the middle 1930s to the middle 1940s, is every bit Cigna’s equal. Her rich, powerful voice is also blessed with considerable flexibility, and an ability on the singer’s part to lighten the color. The scenes between Adalgisa and Norma are powerful because of the strong singing of both, but also the strong dramatic personalities that both bring to every phrase. Castagna’s dark vocal color contrasts nicely with Cigna’s brighter sound, but the two also blend well when that is what the music demands. As for Pinza, we are simply experiencing a miracle as we listen to him. It is one of the most naturally beautiful, rich, and evenly produced voices of any male singer in the recorded history of opera. And that voice is wedded to an innate natural musical instinct and theatrical flair that renders criticism irrelevant. His Oroveso is a towering achievement. Martinelli is a bit more complicated. His voice, as recorded here or anywhere, always exhibits a bit of tightness. But Caniell’s restoration here has given the voice more warmth than it often has in these broadcasts….He will also surprise those who think of him as an Otello with the elegance of his singing, the evenness of his legato, and his feel for Bellini’s long lines. Panizza is another hero in this performance. The more broadcasts of his that we hear, the more we realize his strengths as a conductor. He always shapes the line beautifully, but also accentuates the drama. His ‘Guerra’ chorus is whipped through in a frenzy, with remarkable precision. His conducting is the centerpiece of a performance that can best be described as thrilling music theater. As is always the case with Immortal Performances, the production elements that accompany the discs are extraordinary. A wonderful booklet with incredibly insightful notes by Dewey Faulkner and Caniell himself, and great historical photographs almost make us feel as if we were back in the glorious old house! And if you enjoy the broadcast commentary, it is there as well. Obviously a 1937 radio broadcast has sonic limitations, but this transfer is so far superior to any that preceded it, and frankly is significantly better than my expectations had been, that it is not difficult listening for anyone who has an interest in historic operatic performances. 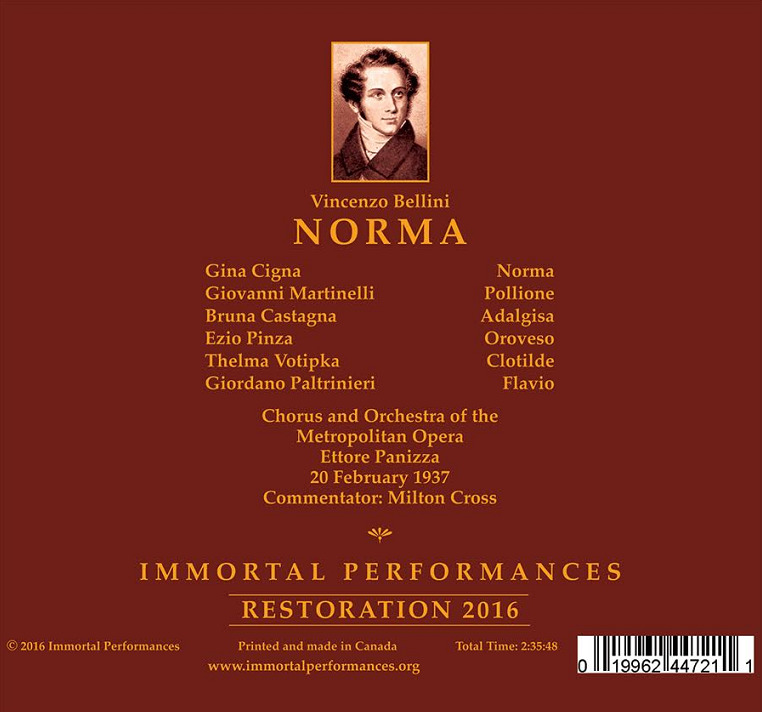 Richard Caniell, the proprietor of Immortal Performances and one of the true geniuses of restoration of historic recordings, has made some changes in the actual performance captured here. He is forthright enough to admit this in his accompanying notes. In referring to his reluctance in the past to even work on and release this performance, he says ‘The major problem for me was Cigna’s occasional flat notes. And then it occurred to me that a sliding pitch adjustment of those notes might rescue them (provided it was in open notes so there wasn’t strong orchestration that would reveal the adjustments) and I could reduce the volume of the sustained, off-pitch, screeched note she sang in the Act II finale so that it wouldn’t grate’.